Kwadwo Sarpong, who graduated from Emory College in 2015 with a bachelor’s degree in neuroscience and behavioral biology, is co-founder of a nonprofit providing hands-on research experience to aspiring female scientists in Africa. 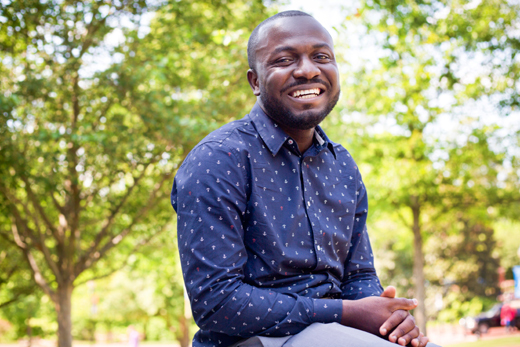 Kwadwo “Kojo” Sarpong racked up plenty of accomplishments in just two years at Emory University before graduating with a degree in neuroscience and behavioral biology in 2015. The biggest: creating the African Research Academies for Women (ARA-W). The organization provides a growing number of African women in STEM fields with opportunities for hands-on research, even as Sarpong works in a post-baccalaureate program at the Icahn School of Medicine at Mount Sinai while he readies for medical school. “To know that students in Africa were not having my opportunities, especially women who wanted the opportunity for research, I wanted to make a change,” Sarpong says. With help from professional researchers, including three Emory College professors, that change has grown every year since Sarpong launched the ARA-W. Since 2014, the ARA-W has provided summer research opportunities for 29 women in Ghana. This year, it will provide research positions to 11 more students in Ghana and, for the first time, 10 students in a year-long program in a research laboratory in Nigeria. Now there is potential for Emory to soon send a student to a lab in Africa, and host at least one African student at a research lab here, says Pat Marsteller, associate dean of undergraduate research and scholarship, who serves as an ARA-W adviser. Such a program would far exceed what Sarpong dreamed of when he arrived in Atlanta from his native Ghana in 2009. With one year of college completed at home, his first hope was for an American college education. It took two years of working — as a hospital janitor and as a stocker and cashier at Wal-Mart — before he was able to enroll in classes at Georgia Perimeter College. He met Marsteller in research programs there and transferred to Emory as a junior. Marsteller recalls Sarpong talking about the need for more research laboratories back home, where it was especially hard for women. Sarpong says his mother’s experience influenced his perspective. She had always wanted to be a midwife nurse, but as one of eight daughters, never went beyond a middle school education. When Sarpong’s older brother was born with paralytic polio, his mothers and others accepted that “evil spirts” were behind his inability to walk because they lacked a scientific explanation. “If I have the privilege of being in the United States as a male, I can use my position here to help women like my mom who are in Ghana, who want to understand and pursue the sciences,” Sarpong says. Sarpong based the ARA-W program on his first paid experience as a researcher, Emory's Summer Undergraduate Research Experience (SURE) program. Now part of Summer Research Programs, SURE allowed undergraduates to conduct full-time research under the mentorship of a principal investigator. One of the women in the first ARA-W program has since gone on to a master’s program, on full scholarship, in the Netherlands. A second is waiting, hopeful, to learn about graduate study in England. “These are students who are just a little younger than he was when he started, seeing a real difference in their opportunities and careers,” says Anita Corbett, an Emory biology professor who serves on the group’s board of directors. Corbett, Marsteller and a third board member, Leah Anderson Roesch, a senior lecturer in Emory's neuroscience and behavioral biology program, all recently received the President’s Volunteer Service Award for their work with the organization. The honor, bestowed in the late days of President Barack Obama’s tenure, recognizes citizens who inspire others to volunteer. The Emory professors say the award illustrates the depth of commitment of Emory undergraduates in general and Sarpong in particular. “The most tremendous outcome would be for people to realize how diverse and amazing our Emory undergraduates are, when they can see the difference Kojo has made by seeing a need and going after it,” Roesch says. Sarpong has also received the Presidential Lifetime Achievement Award, the highest level of the volunteer service award, for his efforts. He was among invitees to the first U.S.-Africa Leaders Summit at the White House under Obama, and won funding from the Clinton Global Initiative, which brings together leaders and experts in different fields to explore innovative solutions to international problems. Last year, he was an invited speaker at the White House United State of Women Summit. Still, he says he relies on his volunteers — including his former Emory professors — to help him manage running his nonprofit while he is also studying in New York. The next goal is to fund and develop an exchange program for an Emory undergraduate to perform research in Africa and a female student from Africa to study here. “Emory attracts students who want to make the world a better place, and I think this program should capitalize on that,” Marsteller says.